Events like the recent Cinci Beerfest may let us think that beer is all fun and games but there is a lot of work that goes into getting a beer to market. A lot of the talk about that work focuses on brewing. However, formula and label approval are a critical linchpin in the process. A linchpin that has become slightly unfastened and caused the delayed release of at least one local beer. But I’ve got good news from Scott LaFollette, proprietor, janitor, and yeast farmer at Blank Slate, that Shroominous has been approved and kegs are headed to the distributor. Keep an eye out for it appearing at bars around town over the next few days/weeks. For most beers, there is no big problem here as the majority of all beers are just water, malt, hops, and yeast. 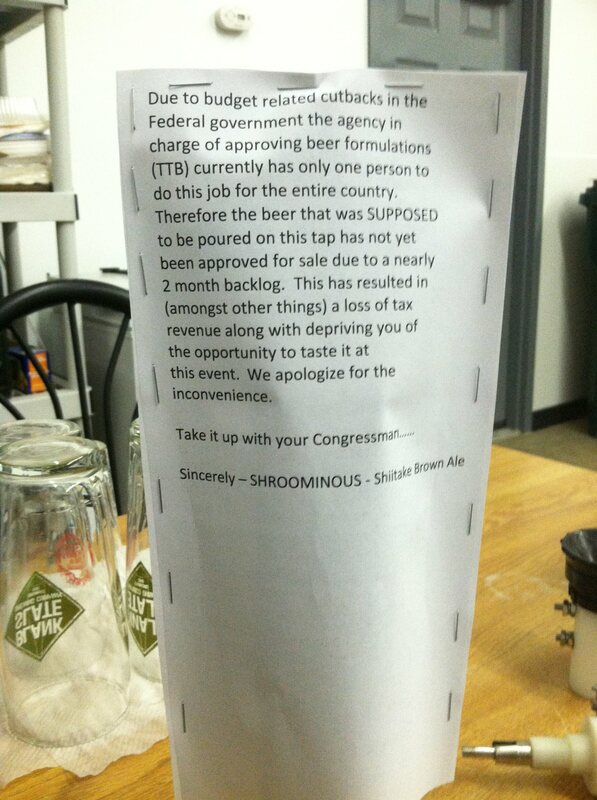 On top of all of this, brewers still need to get approval from the states as well. But with each state possibly varying significantly in their processes I’m not gonna get into that here, maybe I’ll take a look at a few another day. All this being said we need to remember that the Tax and Trade Bureau is full of good people doing their job to the best, and fastest, of their abilities. It’s not their fault if the government continually cuts their funding instead of [insert your own political views here]. Plus the delay on Shroominous hit around the holidays and everyone deserves time off with family. I don’t want anyone to think poorly of the TTB, the story of Shroominous was just the initial reason for me digging into what the TTB is. I saw that and wondered the same thing myself. I swear, it’s enough to turn a body libertarian. Bonus points for starting an article with a Beatle’s quote though. I would also like to include that the TTB website has a handy Public COLA search, which allows you to search for recent label approvals. Its how QCD scoops pretty much every brewer/blog on new beers that will be released in our area. Nice tutorial on the TTB, Tom. You see that? Did you see what I did there? With the alliteration and what not? I have RSS set for new labels on Beer Pulse, but the RSS feed is delayed a bit, so unless I miss something on my first pass, I don’t typically wait them to hit Beer Pulse. Pingback: Blank Slate: "Closed. Thanks For The Memories."